Christian Durieux states that he sought to create comic book poetry with his graphic novel, “An Enchantment.” He definitely succeeds in doing just that. 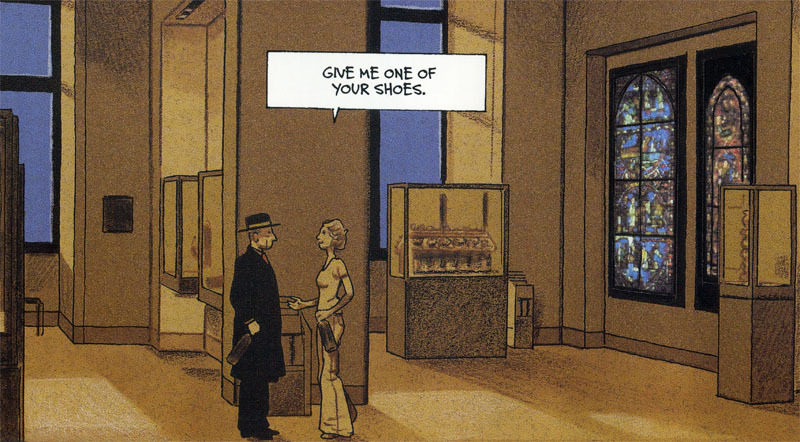 The collaboration between the Louvre and NBM ComicsLit to co-edit books inspired by the Louvre results in such wonderful works of comics. This one is pure magic. It’s like watching a dance sequence with Fred Astaire and Ginger Rogers. The comic flows so well that it glides. It could easily have been wordless but the dialogue is so charming. What happens when a VIP is not at all impressed with being a VIP and skips out on a gala event in his honor? It’s certainly an event meant to impress, a lavish banquet held inside the Louvre. But our hero will have none of it. Instead, he sneaks off with a couple of bottles of wine. It turns out that he has very good reason to be doing this. And his daring will not go unrewarded. He is met by a most lovely young woman who happens to have nothing better to do than to listen to every concern from an older, and restless, man. 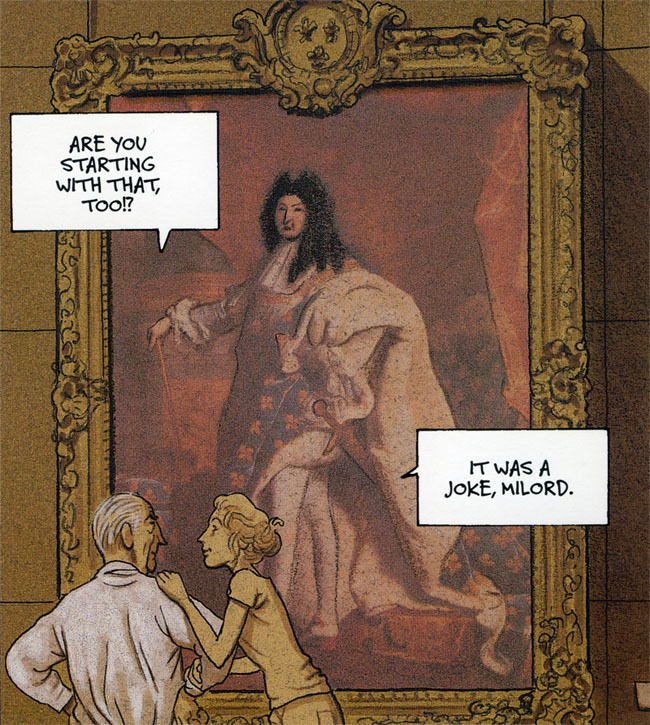 Durieux, in the same spirit as other creators to this series, taps into the beauty, mystery, and history of the Louvre. In one way or another, each book has featured some key works of art from the museum’s collection. 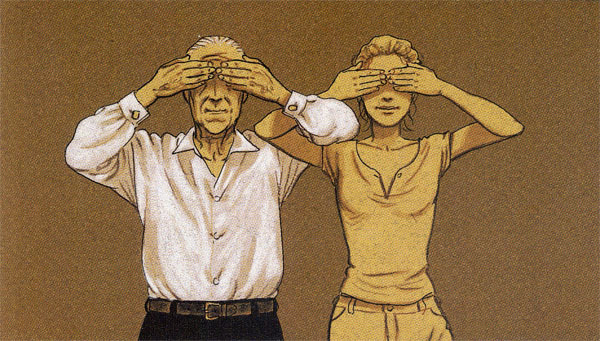 From a cartoonist’s point of view, I can appreciate the fascination with manipulating images, especially iconic images, into one’s own work. It’s a pleasure to find compelling ways to have your characters interact with a venerable work of art. Durieux makes the most of it as he has his unnamed man and woman enjoy a special after-hours tour. A great sense of place and space is achieved too. I can imagine Durieux treated himself to many a museum stroll, accompanied with voracious sketching. His characters move about with such ease. They also know how to relax. You’ll learn a nifty way to open a bottle of wine without a corkscrew if you hang out with these two. And you’ll learn how to better focus your art-gazing. Would you like to know the wine trick? Well, I suppose I could tell you. You take a shoe and place the bottle inside of it. Then you find a surface, preferably a wall, and tap the shoe’s heel. The pressure should force the cork to give way, allowing you to pull it out. Try that the next time you’re stranded somewhere with a delicious bottle of wine but no corkscrew! So, our man and woman end up doing quite well together. They definitely make themselves at home and, if not for the break of dawn and the mundane reality of the world, could have stayed forever. “An Enchantment” is published by NBM ComicsLit. You can learn more by visiting them right here.